property description: The hotel is surrounded by a 100 hectares (240 acres) coconut grove. Our terrain lies on a small peninsula. To the west, lies the Gulf of Mexico with breathtaking sunsets; to the east the famous "Ria de Celestún", a salt water inlet with unique flora and fauna. Because of its importance as the main feeding area for the American Flamingo and countless species of waterfowl and shorebirds it was decreed a Special Biosphere Reserve in 1989.
accommodation: Our 15 spacious cabañas (bungalows) are embedded in the natural surroundings. All of them offer a wonderful view of the Gulf of Mexico. · Two queen size beds surrounded by a fine fabric net to protect you from the mosquitoes and provide you with an intimate atmosphere. · Glass doors and wide windows so you can enjoy watching the moon before you sleep or the ocean when you wake up. 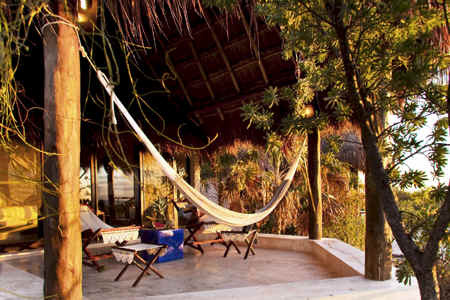 · Private terrace with a hammock, two rocking chairs and two benches. For ecological reasons the rooms are not equipped with air conditioning. 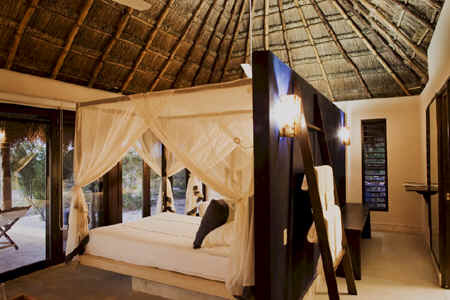 Instead, 2 ceiling fans, a well-designed air circulation system and the Mayan technology, la palapa (thatched roof), will provide for enough refreshing ventilation. 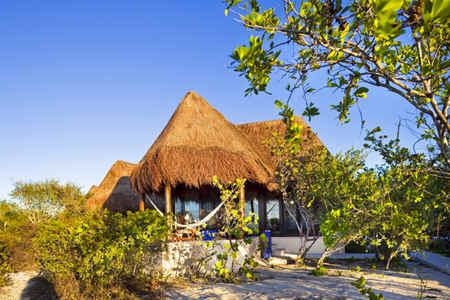 La Casa Club is our main building, which offers a large variety of activities. Here our guests meet for a leisurely chat at the bar, or for a game of table tennis or billiard. In our small library which has books in 4 languages you can sit down and read, or watch videos. We have a wide range of educational videos (culture, nature) and entertainment to choose from. Board games are also available for you to use. All meals are served in the Casa Club Restaurant. Take your time and relish on a tasty Mexican breakfast! Among many other delicious items we offer fresh fruit juices, a seafood omelet and our homemade whole meal bread "Pan Xixim". In the evening we prepare a 4-course candlelight dinner for you. Fresh fish, seafood, Mexican, Yucatecan or international dishes are served. Our kitchen crew is proud of their creations! Our fresh water swimming pool is perfect for relaxation. A pergola provides shade while you read a book, look at the natural surroundings, or listen to the sound of the waterfall. From the pool you have great views of the dunes and the unaffected beach with its countless seashells. Enjoy a cool drink while watching the incredible sunset. It takes place right in front of you! ECO PARAISO is an ecological hotel. The hotel facilities were designed with a conscious effort to adhere to the strictest ecological standards in order to provide first class, comfortable accommodations without upsetting the natural balance of the surrounding ecosystem. Much thought and careful planning went into the design and construction of this hotel complex so that the cabins would flow with their surroundings. We strove to incorporate as much as possible only natural products from the immediate area in the construction, as well as local customs such as the palapa roofs. We don’t buy individually packed products to avoid this unnecessary non-recyclable garbage. All the garbage is conscientiously separated in organic waste and in recyclable and non-recyclable garbage. The organic waste is shred and placed in the Integral System for Recycling Organic Waste (I.S.R.O.W). The recyclable garbage (wood, glass, plastic, paper, metal) is colected in a deposit and transported to a specialized company for its re-use. Finally, the non recyclable trash (less than 3 bags per week) is taken to the Celestun municipal dump. All our water comes from a salty well. We recycle all of our water using biological methods. From the moment of check in, we induce our guest to respect nature. You will receive a welcome brochure, where you can read about or efforts of conservation. Eco Paraiso has a social commitment: the nearby town, Celestún, also profits from our resort: about half of our staff comes from the town; we use the services of the local boatmen to make the Celestún inlet tour; we buy local products like fish, seafood, vegetables and bread; etc. Being an eco-tourist means that you have an awareness and respect for the environment in which we all live, realizing that the actions made by an individual ripple out through the circle of life and affect all, and subsequently making a conscientious effort to keep the earth a clean, safe, enjoyable place during your travels and everyday life. It is important to practice the Leave No Trace concept while traveling, which involves not disturbing or disrupting the plants and animals around you, not polluting the air, earth, or water, taking nothing but pictures and memories, and leaving nothing but a footprint when visiting our many beautiful beaches, caves, pyramids, lagoons, reefs, cenotes, forests and more. 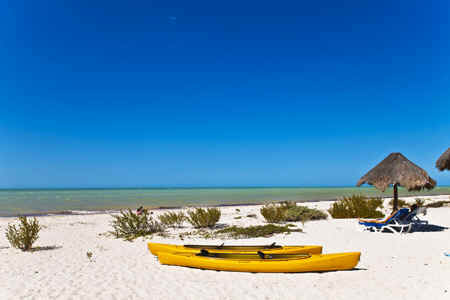 our excursions: The hotel Eco Paraíso has a unique concept that, in addition to your lodging, offers you many interesting and exciting tours. The main focus behind this is to enable our guests to become more intimately familiar with and appreciate the culture, history, unique ecosystem and archaeological wealth of Yucatan. It is also very important to us that you thoroughly enjoy the excursions you take, so we always try our best to keep the atmosphere fun and relaxing, as well as informative. 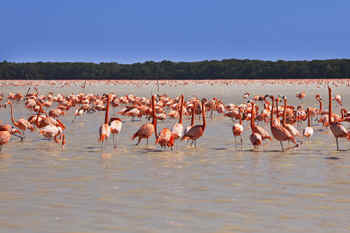 Don’t miss the Celestun Inlet tour to visit the biggest pink flamingo colony on firm land! location: Eco Paraiso Hotel is located next to Celestun Biosphere Reserve in Yucatan Peninsula, Mexico, at the west of Merida city and in front of the Gulf of Mexico. You can arrive by air to Merida or Cancun international airports. From Merida you can get to our hotel by car, bus, taxi or using our private transfers. contact details: please contact owner for further details.